Tourists ride Segways in the ancient Sacromonte section of Granada, Spain. The Sacromonte was once off-limits to tourists. Things were very different in Spain in 1964. Franco still ruled with country under a dictatorship, and our group was forewarned to mind our p's and q's while living in this fascist state. Spain's political system has since transitioned to a parliamentary constitutional monarchy. In 1964, Spain used its own currency, the peseta. It wasn't until 1986 that Spain joined the European Union. When I got settled in with my Spanish family of twelve, I realized how lucky I was. The father was a foreign diplomat and the mother ran the house, a huge penthouse apartment, with help from her mother (or grandmother?) who appeared to be in her eighties and always dressed in black. There were nine children. I shared a room with the oldest daughter who was my age. We got along famously and she helped me immensely with my Spanish. We would all sit down for meals together at the table. Wine was always served at lunch and dinner. There was a definite push by the family to fatten me up. I was awfully thin, having recently had my tonsils removed (which made swallowing difficult for weeks), plus I had endured a bout of intestinal distress when I first got to Spain.) So, wanting to please my new family and experience Spanish food, I ate lots of potato/egg tortillas, fried fish, bread soaked in olive oil, and of course, pasteles every afternoon. I also drank cafe con leche and red wine every day. I gained 30 pounds in three months! Every weekday, I went to class at the Universidad para Estranjeros, studying Spanish history, art and language. On weekends I sometimes went to bullfights, which were terrifying and repulsive to me, but I felt I needed to experience them as part of the culture. Once I went with a girl friend who caught the eye of the matador during the fight. He threw her the bloody ear of the bull after he killed it. She caught it, and was thrilled to keep it as a souvenir. I understood the honor, but that was the last bullfight I ever attended. Years ago in Granada, I had especially enjoyed flamenco guitar singing and dancing. I was drawn to its power and the passion. Flamenco was the music of the gitanos or gypsies who lived in villages at the outskirts of Granada known as the Albaicin and Sacromonte. These places were off-limits to us as part of the college program, because we were told they were too dangerous for us to visit. Franco made it difficult for the gitanos, and they retreated to these neighborhoods. Of course we were intrigued and wanted to pay a visit, but the closest we got was the Alhambra, one of the most marvelous architectural wonders I've ever seen. 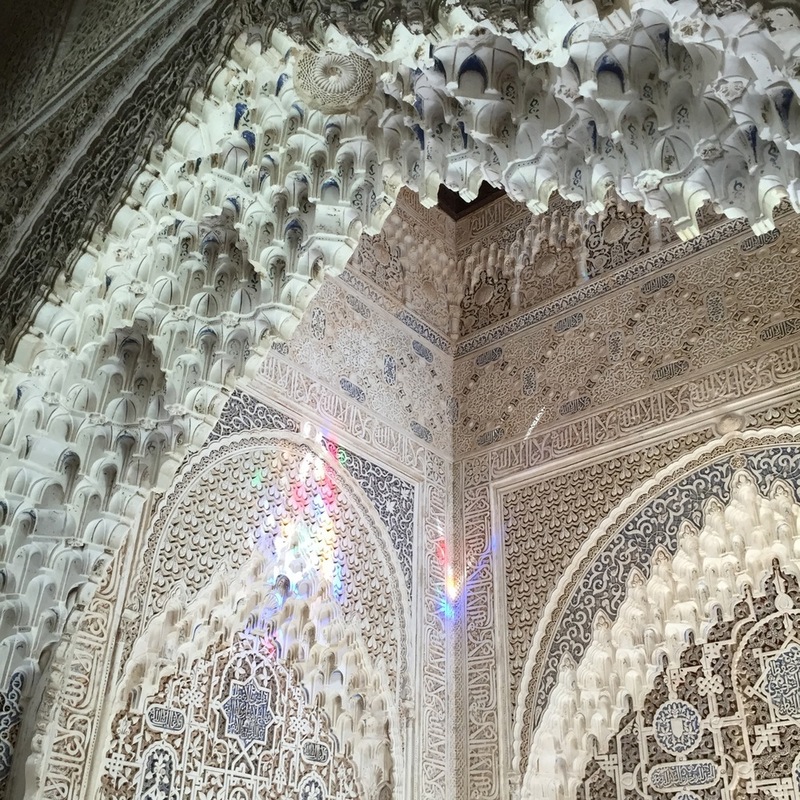 In the Alhambra, you could see and feel the Moorish artistic and religious influence on Spain as well as experience its ethereal beauty and magical gardens. So when I returned to Spain last month, it was Granada that I was most looking forward to visiting. But first, I headed to Barcelona, the closest city in Spain to Athens, where I caught a flight. I had never visited Barcelona before and I was most interested in seeing Gaudi's architecture, especially the Sagrada Familia. Barcelona is a fast-moving, vibrant, chaotic place, full of life and youth, art and music, though against a backdrop of ancient cobblestone streets that form labyrinths where you can easily get lost. Consumerism is booming in Barcelona, as is tourism. I stayed in a modern hotel in the city center, called the NH Barcelona Centro, so it was a great homebase for walking. Shops and restaurants were everywhere around the hotel. I headed to the Metro by walking from my hotel down Las Ramblas, a big street whose wide central divide is exclusively for pedestrians. From the Metro I traveled easily to the Sagrada Familia. When I reached my stop and emerged from the underground, the fabulous church was right there in its full glory. I had bought my tickets in advance (as advised) and went first thing in the morning to avoid lines. It was already hot at 9 a.m, signalling the beginning of an extended and brutal heatwave that lasted the entire time I was in Spain. In this panoramic shot inside Gaudi's Sagrada Familia in Barcelona you can see the riot of color as the sun streams in from stained glass windows. Gaudi was greatly influenced by natural forms. The soaring columns are reminiscent of huge old trees, whose branches form the canopy or ceiling of the church. Exterior of Gaudi's Sagrada Familia in Barcelona, Spain. Construction and repairs are ongoing. Another beautiful building in Barcelona is the Palau Musica Catalana, a concert hall that was built in the Art Nouveau style in the early 1900s. I enjoyed a perfomance there one evening by five classical Spanish guitarists. Being inside this building is just plain fun, as is viewing it from the outside. See photos below. From top to bottom, 1) Entrance to Palau Musica Catalana, 2) inside the building looking up at the ceiling, 3) me in the lobby during a concert. Bronze sculpture on sidewalk of Paseo del Prado, Madrid. A street in old Madrid one early Saturday morning in July. I traveled to Granada from Madrid by train and then bus. The landscape outside Granada was dry and parched, though the irrigated crops of melons, corn, and olive trees were green. When I arrived in the city and took a taxi to my hotel in Granada, I was thrilled that I had booked a place in the Albaicin with such a wonderful view of the Alhambra. The same view as above, at dusk. The day after I arrived in Granada I watched a flamenco show in a tiny neighborhood venue in the Albaicin. The dancing, singing and guitar playing were just as moving and powerful as I remembered from my visit so many years ago. The Albaicin area of Granada has some wonderful street art as well as flamenco venues. Some examples of street art in the Plaza Nueva, Albaicin, Granada. The next day, I got up very early and caught a city bus to the top of the hill where the Alhambra is nestled. I wanted to beat the crowds and avoid as much of the heat as possible. I arrived shortly after the gates opened and I headed directly for the gardens of the Generaliffe. Water features in the Generaliffe gardens. Inside the Alhambra palace looking out at the Albaicin in Granada. 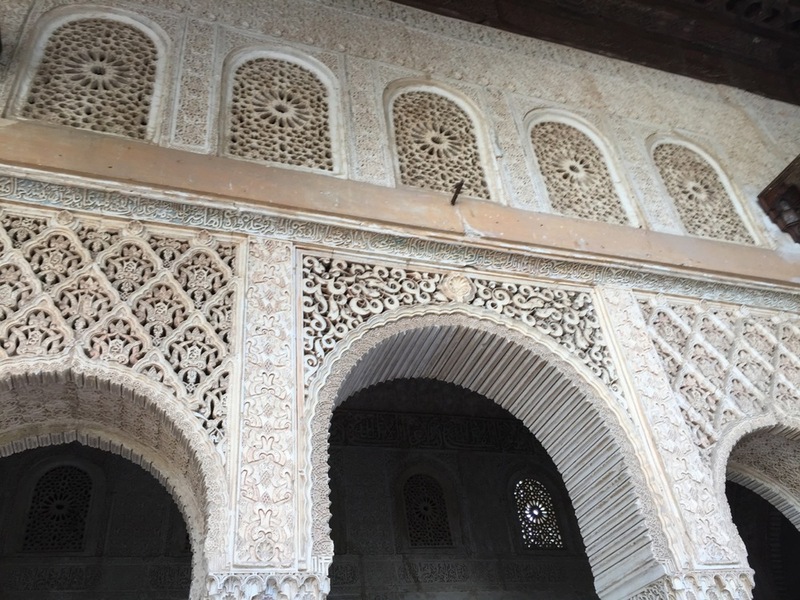 Below is a slideshow I assembled of the Alhambra palace from the dozens of photos that I took. Just click on the photo to see the next shot. My last morning in Granada I arose very early and caught the first city bus to the old Sacromonte neighborhood above the city, where I was once forbidden to visit. Today, it is a UNESCO protected sight, along with the Alhambra and the Albaicin. An ancient site that marks the transition from Moors to the Christians, the Sacromonte was inhabited by the Moorish gitanos, many of whom built their homes in caves on the hillsides. It is now the center of gitano culture and flamenco in Granada, and a tourist attraction. It was Sunday morning when I caught the city bus up the switchbacks to the Sacramonte, and I was the only passenger on the bus. It was a memorable trip because I conversed in Spanish with the bus driver, who spoke no English. He directed me to the footpath to the old Sacramonte Abbey. I walked for several hours on that beautiful morning, taking photos. I then returned to the hotel to spend the rest of the day getting ready for the next leg of my trip--to southern Italy. This house along the main road through the Sacromonte in Granada serves as a memorial to many of the gitanos living there who perished in floods in past decades. The Sacromonte is now a center of gitano culture and flamenco. The buildings in this photo are venues for flamenco music performances in Granada. The Sacromonte Abbey in the hills above Granada.